We all know the playful and multi award-winner Margot, Christophe Claret’s first timepiece developed specifically for ladies, launched in 2014 and based on the theme “He loves me…he loves me not” with a daisy in the centre of the dial. When pressing the pushbutton at 2 o’clock, 1 or 2 petals slide under the dial, and a degree of love (or not) with the French words for: “he loves me: a little, a lot, passionately, madly, or not at all” are selected, all at random and accompanied by a chime at each press. In this version made specially for the Middle East, the answers now appear in Arabic calligraphy on the dial. The random selection of “he loves me: a little, a lot, passionately, or madly” in Arabic is made possible by adapting the movement to match the right-to-left direction of Arabic script. And if you want to reconfirm the selection (or not), a reset pusher at 4 o’clock instantly makes all the petals reappear and turns the ‘sentiment’ display to an ellipsis of 3 dots so you can start all over again. “Layla” means “night” in Arabic, and is also the name of a young woman in a famous love poem written by the Arab poet Qays Al Mulawwah. Verses of the poem are delicately engraved on the mother-of-pearl dial, set with three emeralds at 3, 6 and 9 o’clock. Gold-tipped, hand polished steel hour and minute hands glide over the 12 white, satin-lacquered titanium petals that surround the central emerald pistil. “Layla’s” 18K pink gold case has a curved profile for a feminine look and ultimate wearing pleasure; the visual pleasure is also total. In addition to the soft yet very striking dial, the lugs are gem-set, with the crown hidden on the back next to the upper lugs. The space between the upper lugs is adorned with an emerald, while baguette-cut diamonds shine on the bezel. Through the display back we see the self-winding rotor — a delicately carved, flower-shaped carousel of colors symbolizing sentiments of love, with a central cabochon concealing the rotor’s ball bearings. Each one of the eight triangular precious stones denotes a feeling – hope, passion, tenderness – also translated into Arabic – with each one waiting to align itself with the red lacquered heart when the flower stops dancing. “Layla” is complemented with a green alligator strap. 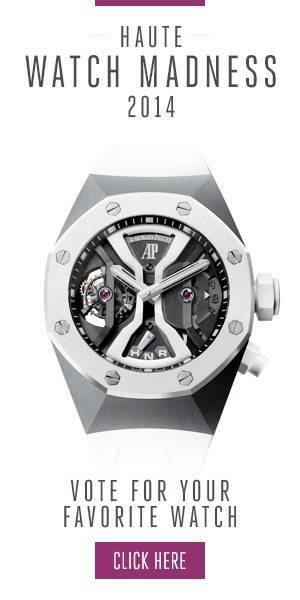 Limited edition of 20 pieces, priced at 288,000 Swiss francs without tax. Available at Ahmed Seddiqi & Sons in Dubai.